Maitha Buhumaid: Dubai Press Club is harnessing all resources to support media outlets in keeping abreast with the latest developments in the media field. Mohammed Al Hammadi: We are open to working with all media institutions and partners in the country. Dubai, UAE, January 21, 2019: The Board of Directors of the UAE Journalists Association unveiled the Association’s new logo and brand identity on Monday at a press conference held at the Dubai Press Club. The event also saw the launch of an ‘Honorary Board’ that aims to enhance the role of the Association in advancing journalism in the country. Designed to reflect the importance of the current digital media era, the new logo was inspired by the four colors of the UAE flag. The logo features lines and waves that symbolise the growing role of digital and social media platforms. A pen in the centre of the logo signifies freedom of thought and the responsibility of the press. Speaking about the UAE leadership’s announcement of 2019 as the ‘Year of Tolerance’, Al Hammadi said all media institutions in the country play an important role in spreading the values of tolerance. “However, content creators on new media platforms have an even bigger responsibility in achieving this mission. They have a key role in shaping the awareness of the public, given their influence and ability to reach all segments of the community,” he said. He stressed that a comprehensive, long-term strategy is necessary for all members to work together to achieve these goals. Speaking on the occasion, Maitha Buhamaid, Director of the Dubai Press Club, praised the vital role played by the UAE Journalists Association in enhancing the journalistic skills of media professionals in the country through their various professional programmes. She also stressed that DPC is harnessing all resources to support media outlets in keeping abreast with the latest developments in the media field. 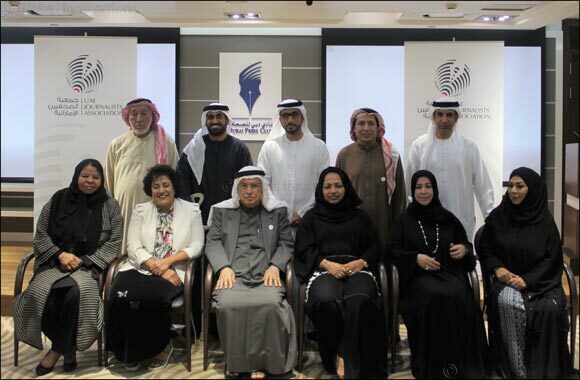 The members of the new board include Abdulla Abdul Rahman Al Hammadi, Nasser Al Dhaheri, Habib Al Sayegh, Abdul Hamid Ahmed Al Zarouni, Ibrahim Al Abed, Abdulla Al Nuwais, Khalid Mohammed Ahmed, Mohammed Yousif, Obaid Tuwirish, Thaen Shaheen, Dr Aisha Al Nuaimi, Aisha Sultan, Abla Al Nuwais, Dr Ali Alajala, Moza Mattar, Khaireyah Rabee, Ali Abu Rish and Dr Hassan Kayed Al Subaihi.